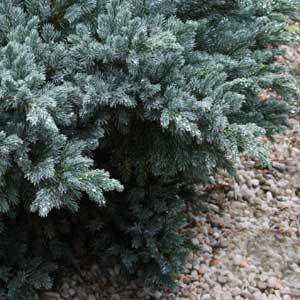 Many coniferous plants make great ground cover plants and Juniperus squamata ‘Blue Star’ is regarded as one of the best. Easy care, low maintenance and versatile. Grow it a ground cover plant, in a rock garden or in a container Juniperus squamata ‘Blue Star’ is a beautiful foliage plant. Naturally low growing and spreading it will reach around .5 metre in width and a little less than that in height over 8 – 12 years. Beautiful bun of stunning blue foliage. Popular as a rockery plant or tub specimen. It does have flaky brown bark which gives it one common name of ‘Flaky Juniper’. It grows well in a sunny position in a well drained soil, and once established is almost maintenance free. Common Name – Flaky Juniper.